The American Federation of Teachers militantly opposes the vast majority of credible education reforms aimed at fixing our failing schools. AFT fights to protect incompetent teachers from being fired by opposing reforms aimed at limiting teacher tenure. AFT’s refusal to renegotiate their costly wages and benefits is driving many major cities into or towards bankruptcy. AFT is a political animal, donating millions of dollars to left-wing advocacy and front groups. The AFT represents the interests of teachers, oftentimes to the detriment of students’ needs. American schools are in a crisis. In early December 2013, the Organization for Economic Co-operation and Development (OECD) reported that American schools’ global competitiveness has fallen behind Latvia, Estonia, and Vietnam in math and science. At best, our schools are a “solid C student” when it comes to competing globally. Rather than admit that teachers unions’ share some of the blame for America’s continued decline in global education competitiveness, the American Federation of Teachers (AFT)—the more militant of the nation’s two teachers unions—doubled down. 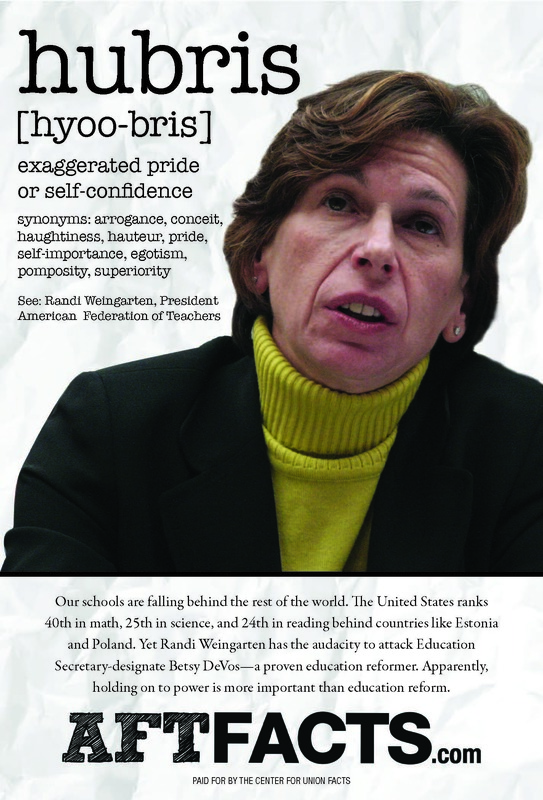 Instead of recognizing that America’s schools need an overhaul, AFT President Randi Weingarten used the OECD findings to call for an end to a host of promising reforms. The tactics and rhetoric that the AFT employs to block any meaningful education reform is remarkable. The AFT’s motivation is clear: maintain the status quo — and the flow of hundreds of millions of dollars in dues. Meanwhile, the AFT’s suggestions for reform are best summarized as “more money to hire more teachers,” who are then likely to become dues-paying union members. After years of negotiating with New York City, by 2003 the AFT local’s contract with the city had ballooned to more than 800 pages of stipulations, regulations, and work rules that hamstrung the city’s ability to reform its failing schools. Dictating that all teachers pay must be in “lock step.” That meant that a gym teacher made the same amount as a science or math teacher, who were hard to recruit. 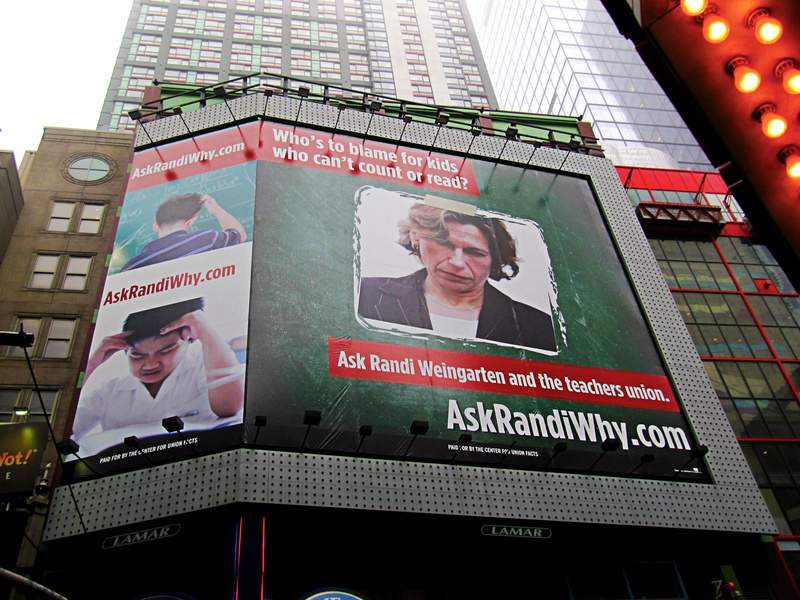 Weingarten was unrelenting in her refusal to give up the union’s ridiculous work rules. 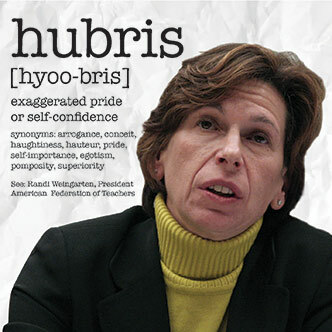 Two years after commencing negotiations, Weingarten threatened to strike during Mayor Bloomberg’s reelection campaign. 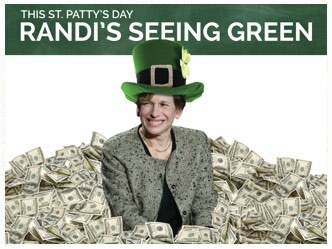 In exchange for giving up some of the work rules, Weingarten secured an amazing 15% pay increase over the life of the contract. The AFT’s insistence on work rules isn’t contained to just New York City, nor is it solely focused on complicating school operations. 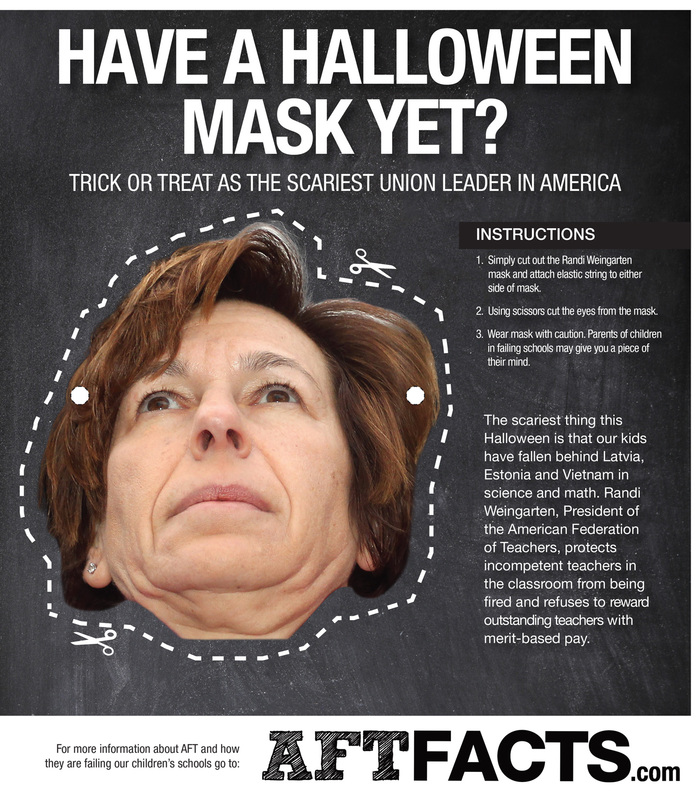 In Buffalo, the AFT-affiliated unions’ contract with the school district stipulates that the school district must pay for an unlimited number of cosmetic surgery procedures for teachers. The school district, which is predicted to run a $51 million deficit this year, spent $2.7 million on procedures like skin peals, hair transplants, and Botox injections in 2011 and 2012. That is down from the more than $9 million it spent for such procedures in 2009. Unlike the National Education Association, which dominates suburban and rural school districts, the American Federation of Teachers dominates inner-city schools. That puts AFT on the front lines of America’s education crisis. For years, the AFT’s mantra has been to fight for policies that effectively throw money at the problem by decreasing class size and hiring more teachers. In Washington, D.C., a U.S. Census Bureau report from 2012 indicates that the city spends more money per student tha any other state in the country. Despite that, the city ranked fifty-first in performance according to data from the Department of Education’s National Assessment of Educational Progress. After years of fighting for higher wages, more teachers, and smaller classes, many major cities are facing an education budget crunch. Between the unions’ pension funds, benefits, and wages, cities like Detroit—which is in bankruptcy, and others which are on the verge—are looking to the union to recalibrate wages. The AFT is not interested in negotiating. In Detroit, for instance, the AFT is vowing to appeal a judge’s decision to allow the city to restructure union pension payouts during bankruptcy. The Detroit Federation of Teachers, which enjoys rich pay packages (corrected for purchasing power, Michigan teachers are the best paid in the nation, reported the Mackinac Center for Policy Policy), would do the UAW proud. Its employees pay only ten percent of the cost of their insurance premiums. While they take extravagant numbers of sick days or personal days — 8 per teacher — they also cash in on “unused sick days” to the tune of $14.5 million a year. What other industries are so surprised when you aren’t sick that they pay you a bonus? Then again, we’re talking about a group that paid people to quit — $4.1. 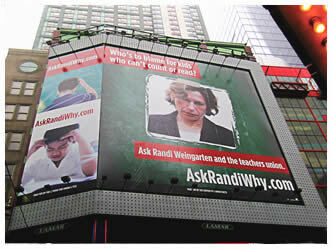 million in “termination bonuses” were handed out to teachers’ union members in 2010-2011. In Chicago, the AFT took tens of thousands of teachers on strike to protest Mayor Rahm Emanuel’s attempt to close a $1 billion budget deficit. In Philadelphia, where the city faces a $304 million budget shortfall, the AFT’s local called concessions “unreasonable.” In an effort push back against the mayor, AFT funded a number of community front groups to push back against the proposed cuts. AFT President Randi Weingarten ended up in handcuffs after blocking a school reform hearing. The average teacher in America makes $52,000. That’s chump-change in comparison to the AFT’s executive leadership. 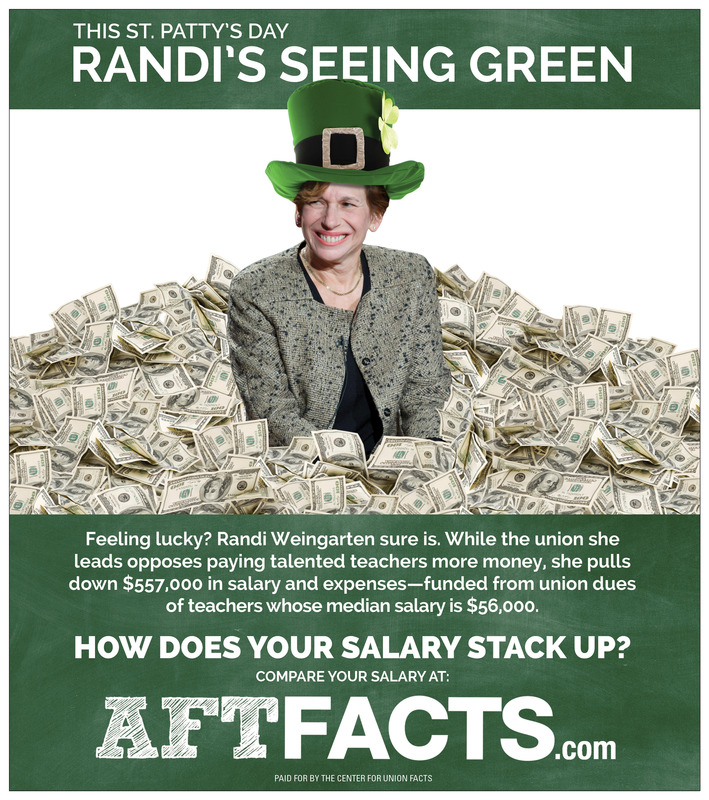 AFT President Randi Weingarten made more than $550,000 in total compensation (salary, benefits, etc.). In fact, across the entire AFT national office, the average salary was more than $100,000. The AFT isn’t afraid to play political hard-ball in Washington, D.C. and state capitals across the country. In 2012, the national headquarters alone reported spending $21 million on political activities and lobbying. Beyond that, the AFT has spent $53 million in political contributions since 1990, according to the Center for Responsive Politics. Of that, 99% went to Democrats.